GrammageScan is an innovative system for in-process grammage measurement of web products, such as impregnated paper, textiles, or films. It was developed specially for these applications. The system is integrated at a suitable point in the production process. Fitted with an automatic traversing unit, the sensor reliably finds the edge of the product even when product widths vary, where it measures the grammage at predefined intervals. 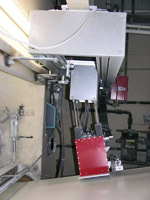 If required (change of product), the measuring head can be fully retracted from the production process. This permits unhindered access to the production equipment.